Mmm...well, first I've to finish the summer versions... : ....but I don't want to make it more complex so for winter versions, I think I'll just add snow in roofs and ground floors. Btw, as I said, I'll try to model the Cathay Pacific air cargo terminal at Hong Kong International Airport. Here you have an image of it. A preview of the big terminal mentioned above. EDIT: While I was using Tilecutter to chop the png file, I've realized that its dimensions are not 4x4, but 8x8!! Anyway it fits on the oficial scale, so it doesn't matter. See it in action. I'm still searching a blueprint of 747-400 LFC a.k.a Dreamlifter to include it too. The AN-225 is much larger its over 10 meters longer and its wingspan is over 28 meters larger. The An-124 is closer to the 747. Yes, I know. The problem is that I can't make them bigger because I would need to use offsets, that are not implemented in 0.99.17. Any way the AN-225 is the biggest airplane possible without using offsets. 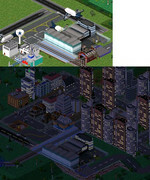 Some ingame screenshots of GBi Air Cargo Terminal. I'll post the pak file tomorrow. 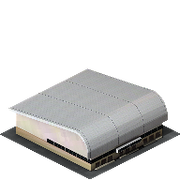 GBi Air Cargo Terminal ready to download. It's a level 3 extension building that means it will increase stop's capacity in 384 units. As always the sources are available at graphics.simutrans.com. One important thing. I've used the latest makeobj (atm, v49) to pak the object and I wasn't able to use it in v100, so I strongly recommend you to update your simutrans copy to v101 in case you want to play with it. Anyway if anybody is able to use it in simutrans v100, please notify it. Thanks very much. I'm glad you like it. Next one will be probably PSA..
PSA freigth terminal finished, 2x2, level 3 with four rotations, winter versions and special night colors for windows and lights. Ramstein Air Cargo terminal finished. 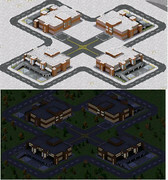 Level 3, 2x2, four rotations and winter version, with special night colors. In addition, this screenshot shows how it looks when you combine some of the buildings.. ....I'm glad. 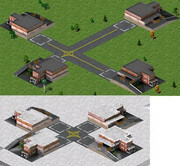 Now it's time to start with level 4 and size 3x3 buildings..
Four rotations, special night colors and winter versions. Simply gorgeous Vilvoh. I'm wondering is there any sort of page wherein your creations are neatly organized? Like a page or something? Thanks a lot. Mmm...I actually don't have a personal page. I've thought about it many times, but I'm quite lazy for that, and the blog it's not a proper place to host those stuff. So that's why almost all addons I've done are spread along the forum...even though, I usually try to make theme paks (trucks, planes, ships, extension buildings, engines, tourist attractions, etc...) so in that sense, we may say there's some order. I'm going to see if I can gather all in a megapak. 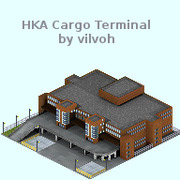 I'm still working on HKE Cargo Facility.. I had some problems because I didn't find a good texture for the building, and even now I'm not completly satified with it but the pixel-art arrangements improve the quality of the whole. 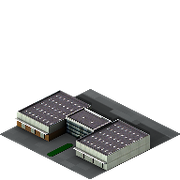 Final version of HKE Cargo Facility. 3x3, level 4 with winter version, special night colors and 4 rotations. I post some images. Enjoy with it! P.S: Only missing the HKAA Mega-Terminal, and I'll come back to planes. Oh my Goodness, this is just stunning. Makes me motivated to build more Airport chains. BTW Vilvoh, i'm sorry for the n00bieness of this question but can you set the rotation of this (and the other one you made) or is it random? I've always wondered. At this moment, it's not random. It depends on the stop and the side of the stop where you place the cursor when you're going to build the extension building. 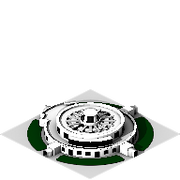 However, I think somebody is working on a patch that allows you to select which rotation do you want to use when you're building an extension building. Have a look at Development board for more info. Regarding the 747-400s, I'd just ask how to make the editing in the .dat files of the vehicles be effected in the game (I've edited some .dat files and copied it into the pak folder but the planes in the game still have the original attributes)? In addition to modify the dat file, you need to recompile the pak file. The pak folder just contains pak files, files with pak extension that contains the images (png file) and the attributes (dat file) of the object. get the dat file and modify it as you want. get the png file related with that object. Finally, put it in the pak folder and check if all is right. After a loong break, I'm back to this topic. 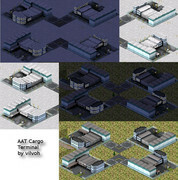 I'm trying to finish the last freight terminal (HKAA Large Cargo Terminal). It's really huge and needs some extra details. Meanwhile, I've started another terminal that will deal with passengers and freights. It's based on 1930 old Gatwick airport terminal. 1930 Gatwick terminal finished...no special night colors this time..
EDIT: I've uploaded the zip again as it was corrupted.